"Impressive...[A] tough, honest novel by a surprisingly wise young writer." "The assured rhythms of the language convey grace, restraint, insights, power, and beauty. Black River transcends its setting and the circumstances of a few people in a small Montana town to say something true and enduring about violence and families, and grief and compassion." "Black River is a powerful meditation on faith, family and redemption." "Hulse evokes the Montana landscape in lyrical, vivid prose...[she] is a gifted wordsmith with promising dramatic instincts." "[A] complex and powerful story — put 'Black River' on the must-read list for 2015." "Whether or not one reads it as a western, "Black River" is surely about the everyday heroism of people, not larger than, but the actual size of life." "This first novel pulses with dramatic tension and emotional resonance...Hulse’s story is lyrical, elegiac and authentic." T"his striking debut novel...has earned critical comparisons to the work of Larry McMurtry, Annie Proulx and Wallace Stegner—and deservedly so." "Hulse carves a character seemingly sprung from the Montana mountains, emphasizing his musical abilities as the thread to his compassion and humanity." "[Black River] is an accomplished Western novel that should signal the arrival of a major literary talent." "Black River is a transcendent story subtly unfolding in flawless prose--a remarkable first effort." "This top-of-the-line modern American Western debut explores the themes of violence, revenge, and forgiveness with a sure hand." "Profound issues addressed with a delicate touch and folded into a strong story populated by wrenchingly human characters: impressive work from a gifted young artist." "Hulse clearly loves Montana, and her own experience playing the fiddle and knowledge of horses shine through the novel." "Comparing the author to Annie Proulx, Wallace Stegner, or Kent Haruf is no exaggeration." Black River is the winner of the 2015 Reading the West Book Award for fiction, awarded by the Mountains and Plains Independent Booksellers Association. Black River is a 2016 PEN/Hemingway Finalist! Watch Joshua Ferris introduce the 2016 PEN/Hemingway honorees, including Black River, HERE. 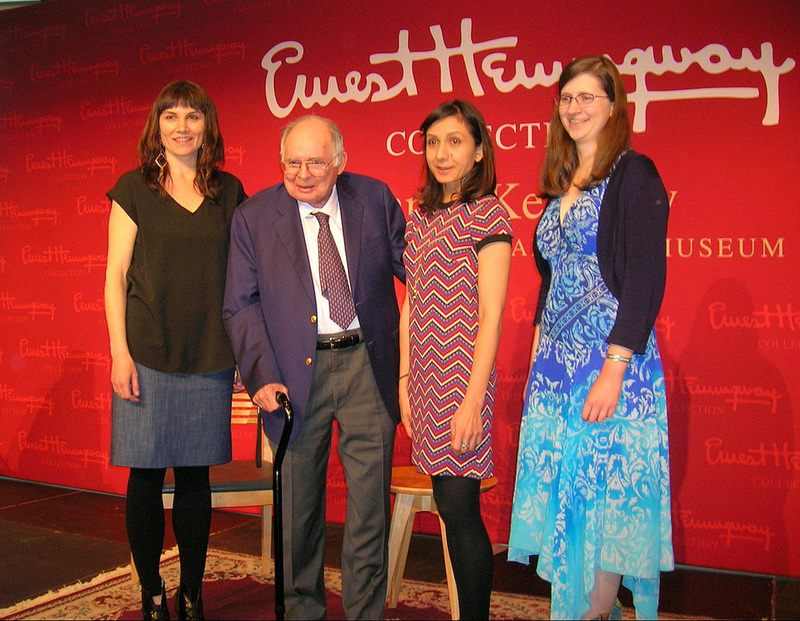 2016 PEN/Hemingway finalist Margaret Malone, Patrick Hemingway, PEN/Hemingway winner Ottessa Moshfegh, and PEN/Hemingway finalist S. M. Hulse. Black River has been shortlisted for the 2015 Reading the West Book Awards! The winner will be announced at the end of May 2016. Black River has been named a 2015 Montana Book Award Honor Book! Black River has been named a 2016 ALA Notable Book! Library Journal calls the Black River audiobook, narrated by George Newbern, one of the best of the year! Black River makes the list! I wrote this new short story for the Summer Stories series in my local newspaper. Ten local writers each wrote a story in some way related to the theme "The Lake." Black River comes in at #3 on this list! In this interview, I talk about my time in Wisconsin, my research process, why I don't worry too much about writer's block, and a few of my favorite books. This interview covers a lot of ground, including character development, the role of setting, and the theme of faith in Black River, as well as more details about my writing process. The Page 69 Test: How well does page 69 of Black River represent the book as a whole? My Book, The Movie: Who should play Wes? An interview with the online literary magazine Drunk Monkeys. Among other things, I talk about why I like reading and writing about the West but sometimes resist the "Western fiction" label. An episode of Nancy Pearl's book discussion television show. Pearl and I discuss Black River, its characters and settings, and why I publish under my initials. I read from Black River and talk with Montana Public Radio's Chérie Newman about the novel. Follow the link to listen. An essay in which I explore the reasons for reading and writing western literature. An interview at Amazon's Omnivoracious blog in which I talk about why I chose to write a contemporary western, how it felt to be compared to Kent Haruf, and my next book. A profile that discusses some of the real-world places and events that inspired Black River. An interview on Washington, D.C.-based author Leslie Pietrzyk's blog, Work-in-Progress. My hometown newspaper profiles me in its features section. A short profile from the local alt-weekly newspaper. I discuss the roles my M.F.A. program at the University of Oregon and my post-graduate fellowship at the University of Wisconsin-Madison played in writing Black River. Read the first chapter of Black River in Issue 147 of TriQuarterly. The music and literature blog Largehearted Boy asked me to create a playlist of songs for Black River. I discuss 10 tracks, including music by Johann Sebastian Bach, Bob Dylan, and Trampled by Turtles. I talk about playing the fiddle, why Montana is the perfect setting for Black River, and which three authors I'd invite to a dinner party. An author profile in which I discuss the modern American West, my M.F.A. program, and cutting more than 40,000 words from Black River.